This story was updated at 3:21 p.m. ET. The U.S. Air Force will try to launch its second secretive X-37B space plane from Florida again today (March 5), after bad weather foiled the first attempt yesterday. The unmanned X-37B mini-shuttle — which is known as Orbital Test Vehicle 2, or OTV-2 — is now slated to launch at 5:46 p.m. EST (2246 GMT) today from the Cape Canaveral Air Force Station. The reusable space plane will ride to orbit atop an Atlas 5 rocket to begin its mysterious mission, if the weather allows. Two launch attempts were thwarted yesterday due to high winds and thick cumulus clouds. The latter posed an unacceptable lightning risk, according to launch provider United Launch Alliance (ULA), which is overseeing launch preparations. The forecast for today doesn't look much better. 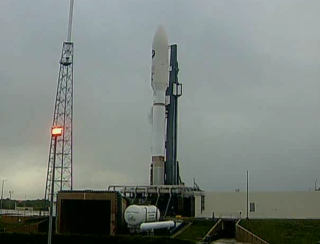 On Friday afternoon, ULA officials said there's a 70 percent chance bad weather will delay today's launch try. If the X-37B space plane does not launch today, another attempt is possible on Monday (March 7). The Air Force would stand down on Sunday to give launch crews time to rest, ULA officials said in a statement today. If the lousy weather persists, more significant delays could ensue. ULA officials said the current launch window closes Monday to make way for NASA's space shuttle Discovery. Discovery is slated to land at nearby Kennedy Space Center on Wednesday (March 9), closing out its final mission ahead of the shuttle program's retirement later this year. OTV-2's launch, whenever it takes place, will mark the start of the X-37B program's second space mission. The Air Force's other X-37B vehicle, known as OTV-1, returned to Earth in December 2010 after spending 224 days orbiting the Earth. What OTV-1 was doing during its long space sojourn is not entirely clear, because X-37B missions and payloads are classified. Some observers have speculated that the vehicles may be the vanguard of a new space weapon fleet. The Air Force has denied this rumor repeatedly, claiming that the X-37B space plane's main mission is to test out new technologies — such as elements of guidance, navigation and control systems — that could be incorporated into future satellites. That's probably true, experts say. And the hardware in question may be gear designed to go into next-generation U.S. spy satellites — hence all the secrecy. The X-37B launches vertically inside the nose cone of a rocket and lands horizontally on a runway, like a space shuttle. It has a solar array that generates power, allowing the craft to remain in space for up to nine months at a time, according to Air Force officials. The X-37B is built by Boeing's Space and Intelligence Systems division for the Air Force. NASA originally used the space plane as an experimental test bed until funding for the project ran out in 2004.The vehicle then passed to the Defense Advanced Research Projects Agency and was ultimately turned over to the Air Force in 2006.